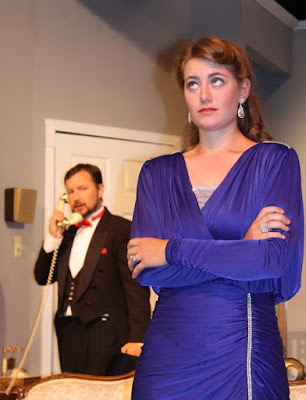 Putnam County Playhouse: IT'S A MYSTERY!!!! 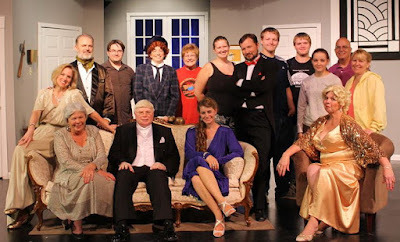 The Cast & Staff of "The Game's Afoot." 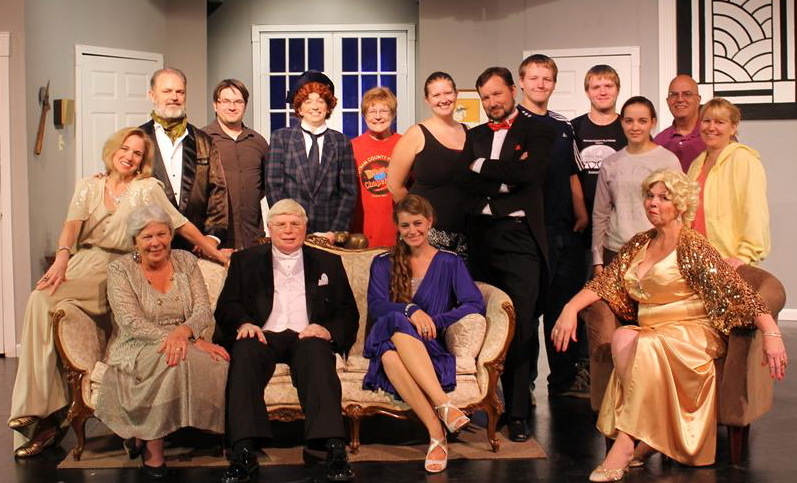 The Game's Afoot ended its run on Sept. 19! 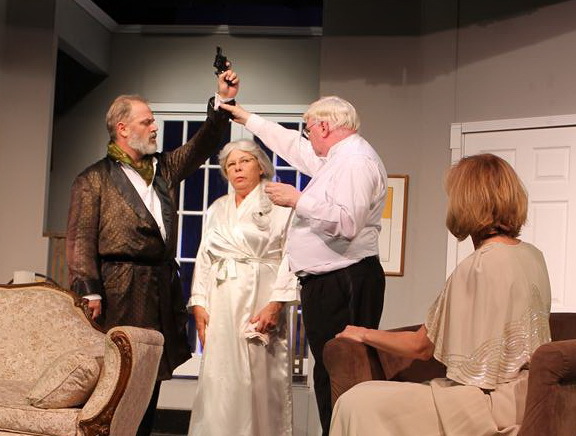 The 54th season of Putnam County Playhouse will close with a production of Ken Ludwig’s mystery-comedy The Game’s Afoot. The production is being sponsored by Shuee’s Furniture & Mattress. Click HERE to read more about our sponsor. As the play begins, we see actor William Gillette (Jack Randall Earles) and his cast onstage in a performance of his play Sherlock Holmes. A mysterious event at their curtain call sets up the rest of The Game’s Afoot to take place in Gillette’s home during a holiday celebration. He takes his role as Holmes to heart and tries to solve a real-life murder himself. Earles most recently directed The Bad Seed and has appeared in many roles at PCPH. Last season, he played Banjo in The Man Who Came to Dinner and directed Guys & Dolls. 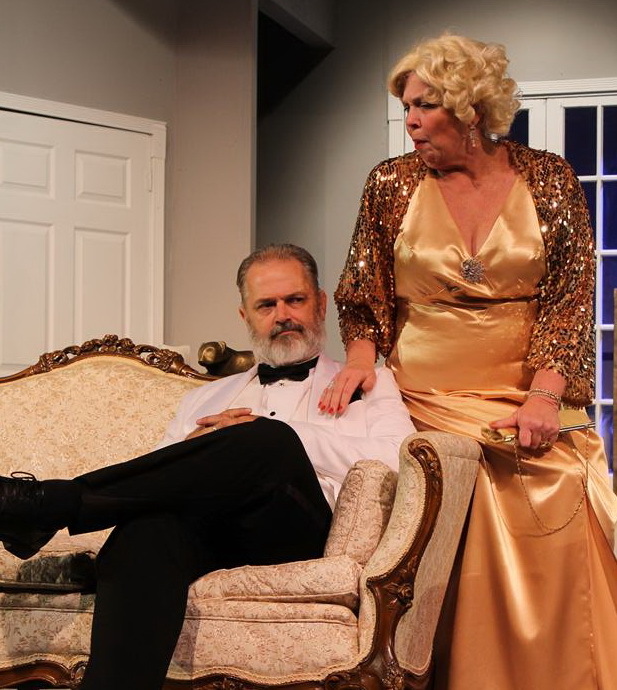 Among his fellow actors are a married team Madge (Caroline Good) and Felix (Tim Good) and a younger duo Simon (TJ Tincher) and Aggie (Anna Harris). 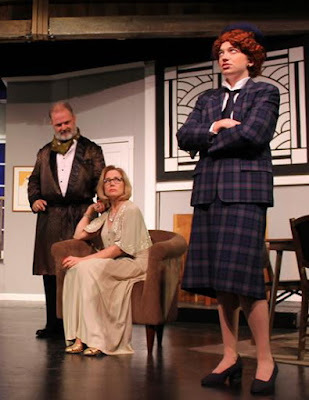 Added to the mix are Gillette’s feisty mother Martha (Vickie Parker), a nosy gossip columnist Daria (Karen Temple), and the local police inspector Harriet Goring (Madison King) who takes it upon herself to join Gillette’s investigation. Parker is making her return to the PCPH stage after an absence of several seasons. She has directed many productions here including Annie, 42nd Street, Showboat, and Kiss Me Kate (twice). She is a former president of the PCPH board of directors and retired from Greencastle High School where Parker Auditorium is named in her honor. Tim and Caroline Good are making their third appearance together on the PCPH stage. 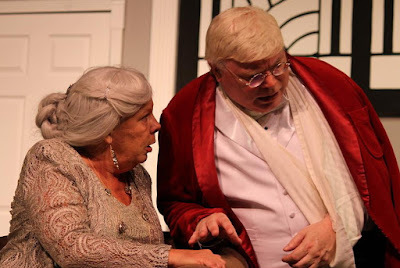 They also appeared in Angel Street and Blithe Spirit. Caroline has appeared in many leading roles here including Marion in The Music Man and Aldonza in Man of La Mancha. Temple won an Upstage Award for her work in I Remember Mama and has also appeared in leading roles in such shows as Annie, Pippin, and Steel Magnolias. King also appeared in Steel Magnolias last season in the role of Annelle. Director for The Game’s Afoot is Dustin Bond. He appeared earlier this season as Adam in 7 Brides for 7 Brothers. This is his first directing assignment at PCPH. Assistant director is Jim Green. The set is by Linda Gjesvold. Bond also designed the lights and sound for the production. Jessica Masner is production stage manager. Brandon & Cameron Wunderlich are on the stage crew. Running the light board is Melissa Green. Hillary Johnson is running the sound board. Costumes are by Shelly McFadden.